As mentioned in a previous posting, UNIDIR has just published its latest study on the humanitarian impact of nuclear weapons. 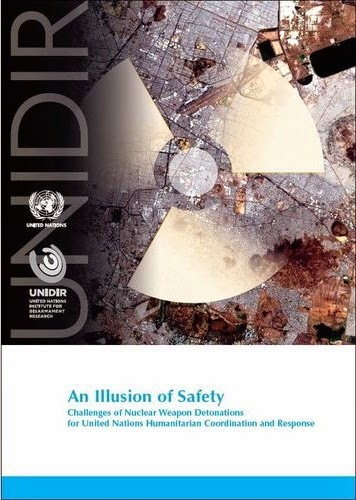 “An Illusion of Safety: Challenges of nuclear weapons detonations for United Nations humanitarian coordination and response” is now available on the Institute's website. 1. The current level of awareness within the humanitarian system is generally low about the specificities of nuclear weapon detonation events or its ability to respond to them. 2. For the UN to offer or be called on to coordinate humanitarian assistance suggests an event is already beyond the capacity of the state or states affected to respond effectively to assist the victims. Moreover, as a rule it would depend upon an affected state requesting it, or on the existence of appropriate international decision-making if the government of that state had been incapacitated by the event. 3. The UN is unlikely to be able to offer much humanitarian assistance in the immediate aftermath of a nuclear weapon detonation, and it would take time for the humanitarian system to deploy. 4. At present there are a number of foreseeable challenges to the prompt and effective use of the humanitarian cluster system in the event of a nuclear weapon detonation. 5. Threat or fear of further nuclear weapon detonation events could vastly complicate decision-making about the nature and scale of humanitarian coordination and response, let alone its delivery. 6. Prevention is the best approach to the possibility of nuclear weapon detonation events. Those humanitarian actors in a position to do so, such as the UN, should plan for the likely challenges of “lower end” nuclear weapon detonations even if such a response is palliative. Such planning would, in reality, also reinforce the need for action to reduce the risk of nuclear detonations happening in the first place. 5. Reviewing current capacities and plans. 3. Examining how eliminating the risk of nuclear weapon use can be better pursued through practical measures. While nuclear weapons exist, the risk of their detonation does too, whether caused deliberately or inadvertently. Humanitarianism marks the broader mission of the United Nations, and since its inception the Organization has taken a strong stand in favour of nuclear disarmament. The initiation of specific planning for how to respond to a nuclear weapon detonation would appear to be logical and consistent with both these aims. The development of necessary understandings about decision-making and a protocol for planning can be based on existing humanitarian coordination practices and need not require sizeable resources. The rapid mounting of a well-coordinated response will have an impact in reducing the level of human suffering, even if it may not assist those directly affected in the immediate aftermath. An earlier UNIDIR publication, “Viewing Nuclear Weapons through a Humanitarian Lens” edited by Borrie and Caughley, can also be found on the Institute’s website. UNIDIR has this week published its latest study on the humanitarian impact of nuclear weapons. 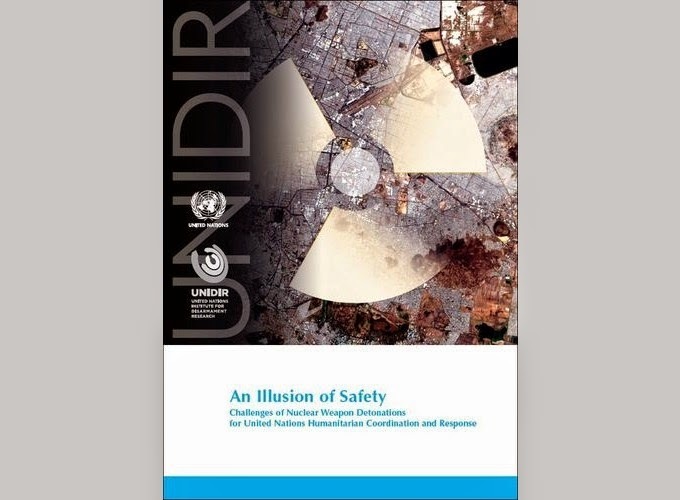 “An Illusion of Safety: Challenges of nuclear weapons detonations for United Nations humanitarian coordination and response” is now available on the Institute's website. UNIDIR’s study was carried out in cooperation with UNDP and OCHA and includes a foreword by Helen Clark and Valerie Amos, the heads of those two UN agencies respectively. The study describes the current humanitarian system, and considers challenges for its activation and operation in the face of a range of plausible, illustrative nuclear weapon detonation scenarios. As a scoping exercise the study identifies specific issues that warrant further policy and operational attention in order to enhance civilian protection from nuclear weapons. It suggests steps the humanitarian system could take to better plan for such eventualities, and it reinforces the importance of preventing nuclear weapons from ever being used again in populated areas—whether deliberately or accidentally. Even if the probability of a nuclear weapon detonation event is viewed as low compared with other sudden-onset disasters, it remains a real one. There are as many as 17,000 nuclear weapons in the arsenals of nine states, and growing evidence of accidents, mishaps, and near misses since their invention. The prospect of use of single or multiple nuclear weapons by a state, whether deliberately or inadvertently, cannot be excluded. A single nuclear detonation in an urban area by a non-state armed group is another possibility. Nuclear weapon detonations could occur in populated or remote areas, with differing implications in terms of harm to human life, infrastructure, and the environment. The consequences of even one nuclear weapon detonated in or near a population centre would be sufficiently disastrous that the United Nations-coordinated humanitarian system could be called upon to assist the victims. UNIDIR’s study indicates that this would pose a number of serious practical and policy challenges for the humanitarian system. Problems range from the particular characteristics of nuclear detonations such as prompt radiation and radioactive fallout to large numbers of injured people with multiple trauma, serious burn injuries, and radiation-related illness, to widespread fear and disruption, and a low current level of awareness and planning for response. There are inadequate specific procedures and systems appropriate to nuclear weapon detonations compared to preparedness for civil nuclear accidents - from which such detonations differ in significant ways. Protection of humanitarian personnel is highlighted as a particular issue of concern. In drawing attention attention to the immense challenges of preparedness and response to nuclear weapon detonations in populated areas, the study reinforces previous findings, such as those of the WHO in the 1980s, that the only really effective response to the public health effects of the use of nuclear weapons lies in preventing that use. Fuller details of the main findings of UNIDIR’s study will be listed in a separate posting on this site. An earlier UNIDIR publication, “Viewing Nuclear Weapons through a Humanitarian Lens” can also be found on the Institute’s website.